Private Home! 4 bedrooms 3 baths. Week ..... $2900/week; (NOT Saturday to Saturday). Keywords: Point Liberty is a spectacular oceanfront home at the end of a private gated road. Fully-furnished kitchen open to dining area which is open to the living area. A very large open style modern home so that where ever you are, there it is... The ocean, the crashing waves just outside, the sunsets, the whales, and the breathtaking views! Just outside all rooms you have immediate access to the large patio and the beautiful ocean. On the patio, at the very edge of the world is a large, top of the line hot tub for your relaxation. The gourmet kitchen has a JennAir oven and gas cooktop with all the necessary equipment, dishes, pots and pans, serving bowls and platers, china, wine glasses. Also a fully-supplied pantry with spices, flour, sugar, coffee... Most of the basics. All on a private approximately two acre lot. Available for small weddings or events. Cell phone service only. Very good cell signal. Right ON the Ocean! Please see customer reviews! The pictures do not do the view justice! 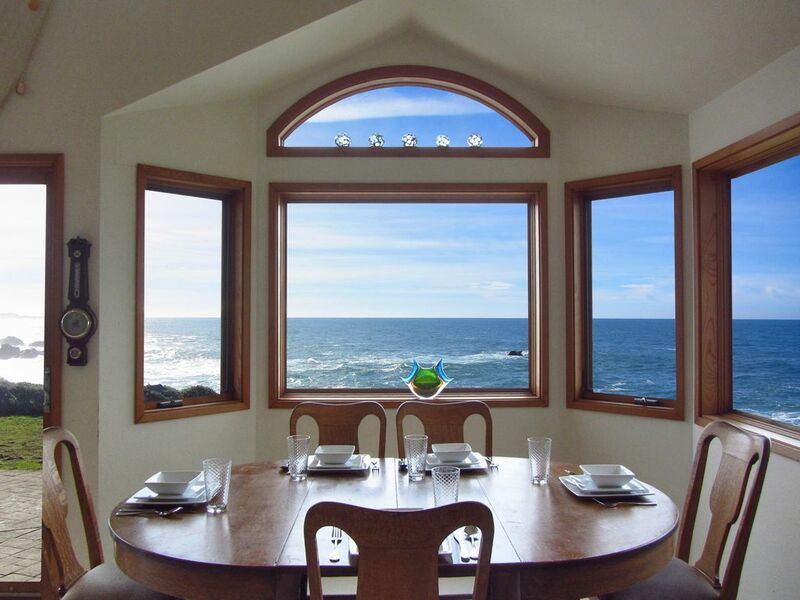 We had a lovely time in this beautiful house with a magical view. This is a lovely place to spend a weekend in the Mendocino area. Ready to stay at a lil slice of paradise? Best property I have rented in the last 10 years for my family and I to reconnect and enjoy Mother Earth at her finest! Great kitchen set up, all bedrooms were clean and cozy. If I was forced to say anything negative, the lights and switches were kinda confusing but by the time we were ready to go, they all made sense! Jim was kind and prompt. We cannot recommend this spotless, breathtaking home enough! Every detail has been lovingly thought of, including the hot tub with the completely unobstructed view of the powerful Pacific. No matter if you are celebrating a group event, as we were, or crave time alone with your love, this is the spot. Thank you to the generous and responsive owner, Jim. When we couldn’t figure out how to warm up the hot tub, he had a repair person there immediately to install a new pump, refill with fresh clean water, and voila, we were happily bubbling away. The home is very well appointed, and located within walking distance to the Botanical Gardens. There are several grocery stores, and Glass Beach, and charming downtown Fort Bragg are only ten minutes away. However, we spent most of our time enjoying the home, cooking, sampling wines and champagne, and reconnecting with our family. We can’t wait to go back. We booked this house for a girls getaway. It was perfect. The view was magnificent. We were right on a cliff and the vistas and sunsets were wonderful. The house was pristine clean, kitchen was well stocked, beds comfy. It was exactly what we had hoped for. We cooked in and enjoyed our time lounging in the common room area that had multiple sofas. The house is perfectly situated between Fort Bragg and Mendocino. We would definitely come back here again. The home was very clean. We loved the views from all of the bedrooms. The owner Jim Robichaud was very nice and helpful. We all hated to leave. Look forward to going again. I don't think we could have found a better place to stay.